I’m Not Inviting Jessica P. To My Birthday Party. Here’s Why. Year after year, my birthday party has been an event that our entire grade looks forward to, not just as a celebration of my turning another year older, but of our collective bond as students of Polk Elementary. It wasn’t that long ago that we were letting go of our mothers’ hands, taking our first steps onto the blacktop, and lining up to be identified by the people who would become our teachers. Sara B., Adam K., Adam P., even Ashleigh H. A place for everyone, together. Until now. It is far past time to have a conversation about the behavior of Jessica P., and why it leads to one clear decision: She will not be invited to my birthday party—not this year, not ever. Freshest in all our minds is this week’s recess incident, in which Jessica P. threatened to cry—and made good on that threat—if she wasn’t allowed to be Elsa. In essentially taking our playtime hostage, Jessica P. not only denied having been Elsa the previous day (she was), but also rejected the very notion of being Anna, a stubbornness made especially egregious in light of Lauren L.’s generous, dare I say noble, concession to be Olaf. For Jessica P., this was not enough. For Jessica P., it is never enough. She will not be invited to my birthday party—not this year, not ever. 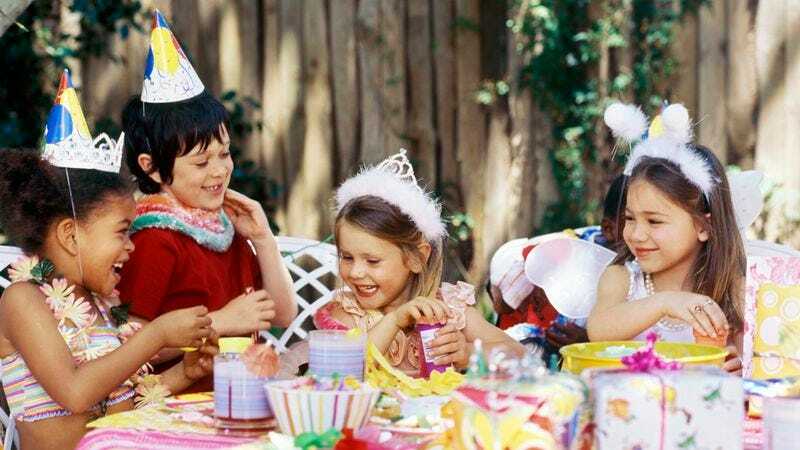 All of this could be seen as circumstantial if Jessica P.’s behavior was contained to school, but we have demonstrable examples of past birthday parties that have received the full Jessica P. treatment. Tickling Lewis R. until he threw up in the ball pit? Jessica P. Getting scared at cosmic bowling and telling Mrs. Reynolds that she was epileptic so they’d turn the lights back on? Jessica P. The list goes on and on, but the opportunity to ruin my birthday party—OUR birthday parties—must stop here. I don’t think I’m being an alarmist when I say that it’s only a matter of time before she bites someone.